I hadn't forgotten my promise to post more wedding pictures. It's simply been a very busy week. Mr. at Home went out of town to a symposium, we started school, softball has started, there was a birthday party, and on and on. And then there are the technical issues. Did I mention that my laptop suffered a debilitating injury on its trip to Texas? I kept it between the couch and the recliner where it was accessible to me, but not to little feet. It could have been little feet, big feet, the recliner, or the reclining end of the couch. Something put the smackdown on my little red laptop and cracked the little red cover and the screen it was trying to protect. It's still useable; it just has a large black spot on the screen that is a pain to work around. Mr. at Home, being the wonderful techie he is, moved my laptop profile over to the desktop when we got home, so I still have all my info just like I like it. Except that I hate being stuck sitting at a desk after years of laptop freedom. So I still sit on my bed and use the gimpy laptop for my on-line stuff (like writing posts), but the photos I needed were uploaded onto the desktop. At any rate, I am now sitting nicely at my desk, typing on the iMac, and I can add the photos from here to the text I wrote downstairs, and the post will finally be One. Whole. Complete. Post. After a stormy night, Mr. at Home and I were up early the day of the wedding. Our girls and the other flower girl were meeting us in town, then we had to head up to the big city for early appointments to get some fancy hair-dos. We ended up arriving at Sweet 'n Sassy really early, so we walked across the courtyard to Sonic for drinks. Before we had even sat down with our breakfast snacks, the skies opened up and the rain poured down. Hard, heavy drops. I have never been so thankful for an indoor eating area in my life. But I was even MORE thankful for the wonderful Mr. at Home who walked back across the courtyard and got the car to come pick us up. He's my knight in shining armor. 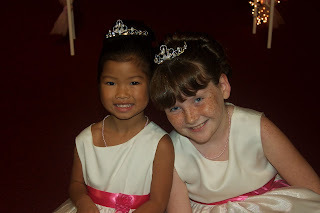 The girls got their beautiful up-dos complete with tiaras and silver glitter hairspray. We picked up McDs for lunch, then it was back to the church. The grown-ups oohed and ahhed over the girls' hair, everyone got dressed, and it was time for pictures. I finally had time then for ME to get ready. The bride and I hung out in the dressing area since everyone else was being photographed with the groom. As soon as I was dressed, the action began and I ended up being pressed into service in all sorts of interesting ways. Help the bride with the dress during a last-minute potty break, help clean a spot of lipstick off the dress and keep the bride from getting upset over it, finish setting up the groom's cake, ask who's lighting the candles, find a safety pin, direct various relatives to the rest of the family, etc. I finally sat down in the front pew off to the side waiting for the ceremony to start. 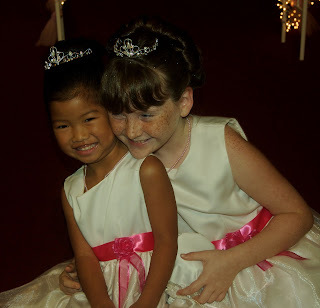 It was so sweet to see my nephew as the ringbearer and the girls as flower girls come slowly up the aisle. Then the doors opened wide and the bride came in. 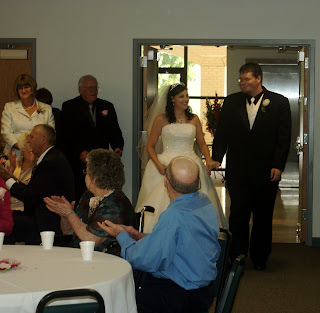 By the time she past the front pew, her tears were flowing freely and my brother stood up front fighting back his own tears. It was beautiful. 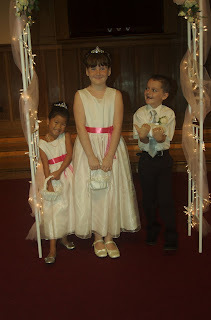 As soon as the congregation was asked to be seated, the flower girls and ringbearer all came and sat with me. We knew that left in front of an audience dressed in a fancy dress with fancy hair, L would be dancing and carrying on in no time. Between her and the antics of my talkative 7-year-old nephew, there would be no one watching the wedding. So we quickly got them tucked away in a pew under my watchful eye before they had a chance to do anything. Thankfully, the ceremony was short and immediately afterwards, the children were demanding "cake"!! But I quickly gathered my kids and took a few of my own pictures while they were so fancy. 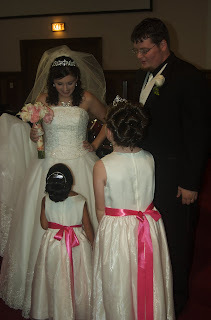 These are the girls and my nephew (my sister's oldest) who was the ringbearer. Isn't he just a treat with those missing front teeth? The girls look just precious here. I finally had to threaten them to get them to pose for one nice picture. This is what most of the rest of them looked like. I also took this one of the girls and the happy couple. I thought it was so cute. After a few more pictures, we finally made it over to the reception hall and I got a shot of the new Mr. and Mrs coming in. Those are my parents just beside them. After the reception, we raced back to my parents' house, frantically packed since we were leaving the next morning, and then drove back into town for a dinner that was thrown by the bride's parents. It was one last chance to sit and talk with family friends before we left again and we weren't going to miss it. I think my brother has found himself a wonderful wife and I've got a great new sister-in-law. I thought it would seem odd to have my little brother all grown-up and married, but it's really the most natural thing in the world. The difference in our ages is becoming less noticeable as the years pass and we have more in common. I'll leave you with two other pictures that will warm your heart. 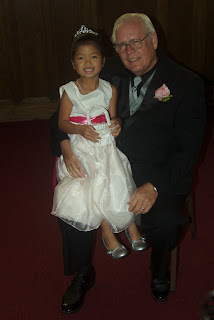 The first is of my dad and my youngest, who adores him. 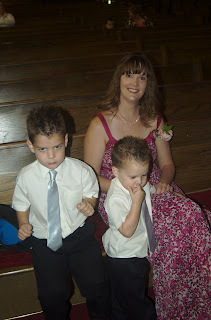 The last is one of my sister and her other two boys. (I swear that I have yet another sister, but I somehow failed to get a decent picture of her and she wouldn't be too happy if I posted the one L took of her with extremely red eyes and a chip halfway in her mouth.) It's an extremely typical shot of the middle child who poses like that anytime I point a camera at him. Yep, my little sister has three very cute and crazy blessings. The girls look just precious!! So beautiful! Sorry to hear about your lap top. I just started a homeschooling blog (in addition to the other one) and I have you on my blog roll of homeschooling families. If you would prefer not to be just let me know. Oooh, the girls look just BEAUTIFUL!!! !